Lately, my husband and I have been on a mission to remove chemicals from our lives. We’re not eliminating everything all at once, or are we 100% there yet, but we are trying little by little to use more natural alternatives whenever possible. For example, I had a major Diet Coke habit for many years. One day, my husband pointed out that the massive headaches and migraines I was getting seemed to be connected to my consumption of Diet Coke. I didn’t believe him, but he told me that he noticed the days I was drinking Diet Coke were the days I had headaches. Sure enough he was right. We did a little research and kept track of what I was eating and drinking and discovered that any food containing Aspartame was causing me to have migraines. I stopped drinking my favorite diet soda, and the migraines immediately stopped. What does this have to do with toilets you might ask? The point I’m trying to make is that we’re all better off using and ingesting as few chemicals as possible. Are you likely to remove EVERY toxin from your life? No, absolutely not (even if you live like a pioneer there’s still toxins in the air and soil) but you can minimize your exposure whenever possible, and this is a great way to do it! I have to admit, I can be fairly lazy. You could tell me that something is bad for me, but if the alternative is super complicated, I might just wind up rolling the dice and taking my chances with the original. That’s why I was excited to find something to clean my bathrooms that is not only all-natural and non-toxic, but just as easy to use as conventional cleaners! To whip up this concoction and get your commodes sparkly clean, you need to round up 3 simple ingredients you probably already have at home. Note that the exact measurements don’t matter 100% but the ORDER in which you put them is the important part. Sprinkle 1/2-3/4 cup baking soda in the toilet bowl, making sure to get some on all the inner parts of the bowl, not just directly in the water. Let sit for 10 minutes, then scrub gently with a toilet brush and flush. You’re done! For stubborn stains, after the 10 minutes add more baking soda to the sides of the bowl and use a brush or scouring pad to scrub the stains with the baking soda. You can moisten with some of the solution as well. Fill a small bowl with undiluted vinegar. You can add a few tablespoons of lemon juice or a few drops of lemon essential oils for scent if you’d like but it’s not required. Soak a clean sponge or rag with vinegar and wring out-clean as usual, dipping back in vinegar as necessary. If scouring is needed, sprinkle the surface with baking soda, then scrub with the soaked sponge. Rinse with hot water. You can also keep your undiluted vinegar solution in a spray bottle (they sell empty ones at Target, Walmart or Dollar Tree, usually near the mops and cleaning supplies) to use for cleaning the entire bathroom. Vinegar is of course non-toxic and you won’t have to worry about your kids getting into it. Worst case scenario they come out smelling like pickles! In fact, older kids might just ENJOY cleaning the bathroom now, because the toilet turns into a cool, fizzy science experiment! Not only is this cleaning method better for you and your family AND your wallet, but it’s also better for the environment too. You’re not pouring a bunch of toxic chemicals down the drain when you clean your bathroom! One more item worth mentioning- if you’re put off by the smell of vinegar in your bathroom, don’t worry: When dry, the smell dissipates and you’re left with no lingering scent. Which is awesome, because those commercial cleaners are loaded with floofy fragrances that are toxic too! What do you think? 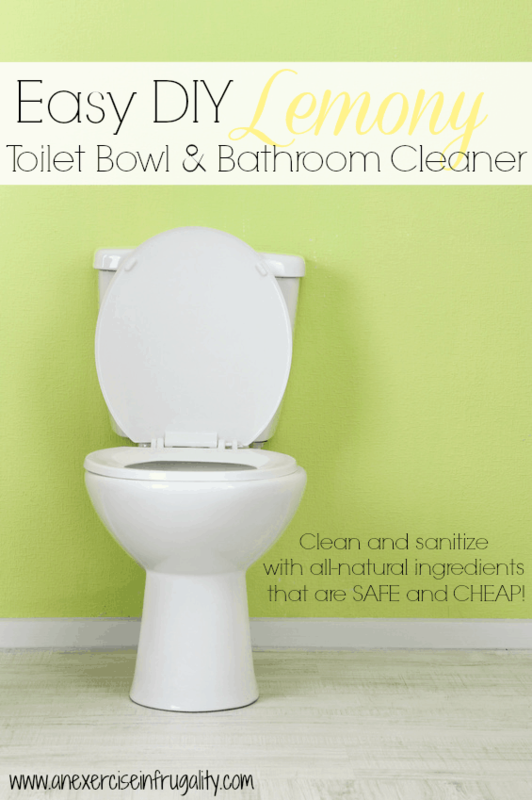 Will you be trying this all-natural DIY Toilet and Bathroom Cleaner?